One of my key commitments to Oregonians is accountability for how we spend your state tax dollars. The people of Oregon who pay the bills have a right to know how their money is being spent. To that end, effective today, the Secretary of State’s office will post online our agency’s “checkbook” ledger — a detailed list of all expenditures. Everyone will be able to evaluate how our agency’s divisions budget and spend every dollar, and our office is open to answer any questions you might have. I believe this is another meaningful way citizens can engage their representatives. Going forward, these expenditure ledgers will be updated in the middle of each month. Hopefully, our leadership in transparency will encourage other state agencies and local governments to do the same. Several other states, such as Ohio, already post all state expenditures online with frequent updates. Oregon government spending data is currently available to the public, but critical information is frequently obscured through inadequate detail and unnecessary delays before disclosure. How public dollars are spent should not be a secret, and it should not take a lengthy public records request to obtain the information. Oregon can and should do better! Lack of transparency has contributed to the wasting of hundreds of millions of your tax dollars on unnecessary and poorly run government projects. The Oregon Transparency website already posts some financial information, but the information is often incomplete and outdated. This lack of completeness makes it difficult for Oregon citizens and members of the media to piece together the puzzle of how Oregon’s government spends your tax dollars. For example, several months ago, a Forbes article reported that between 2012 and 2016, former Oregon Secretaries of State were responsible for wasting millions of dollars on “marketing and propaganda.” However, when my financial team researched these allegations, they found most of the spending referenced by the article was actually for critical functions like printing and mailing voters’ pamphlets, supplying citizens with voter registration cards, and printing and mailing business registration forms. Unfortunately, the true purpose for the expenditures was hidden from the article’s author because the Oregon Transparency website listed such necessary spending in the vague budget category of “advertising, publicity, and publish/print srvs” without providing specific details. In other agencies, however, the same general advertising budget category concealed wasteful spending, such as millions misspent on marketing for the failed Cover Oregon project. Clearly, Oregon needs more financial transparency, and the Secretary of State’s office is going to lead the way. We’ve posted detailed spreadsheets online for all Secretary of State external payments for past and current budgets. The most recent file is for the 2015-2017 budget that ended on June 30, 2017. Please note this is a preliminary accounting which will continue to be updated each month. In some instances, vendors do not send bills for several months, therefore, the 2015-17 numbers may not be finalized until December. Payroll information is taking a bit longer to include in our programming and will be uploaded by mid-August. Since dates listed in the spreadsheet are payment dates, not purchase dates, some 2017 payments are actually for expenditures made by the prior Secretary of State. We don’t yet have an easy way to include the purchase date, or we would have included that as well. I want to especially acknowledge our excellent accountant, Kevin Herburger. In only a few hours, Kevin sorted the data into a readable format and created a way to efficiently run updated reports each month. This new policy of fiscal transparency will empower you, the taxpayer, your elected representatives, and the media to hold us accountable. As part of our accountability effort, the following are examples of expenditures made since I took office that you will see in the 8,483 line items for the 2015-17 biennium. Final Cost for printing Administrative Rules: We incurred $33,495 for printing annual books containing thousands of Oregon’s Administrative Rules. This year we are transitioning to a searchable, transparent online system for Administrative Rules that will save time and money. We will never again have to spend this kind of money for AR printing. Investment in technology that will increase efficiency and save money long-term: We incurred $17,107 for conference room TVs, cameras, and related equipment. With today’s technology, we need fewer face-to-face meetings in Salem. Thousands of hours in traffic and thousands of dollars in transportation costs will be saved by holding videoconference meetings, particularly with Oregon’s 36 county elections clerks, many of whom live and work in remote parts of the state. These savings to both citizens, local officials, and Secretary of State (SOS) employees who telecommute are made possible by one-time costs for technology and software. In short, the SOS is implementing cost-saving ideas from the private sector that will increase the productivity of our staff and benefit Oregonians across the state. Investment in staff training to improve performance: We incurred $35,170 for an intensive two-day training program and materials for every employee in our agency. In order to improve agency services to the public and improve effectiveness throughout SOS programs, in addition to skills training expenses, we are providing training from the Arbinger Institute to approximately 220 SOS team members. We’re in good company. Arbinger has been used by top organizations worldwide, including Intel, Nike, HP, Microsoft, MIT, US Army Corps of Engineers, Xerox, Chrysler, FedEx, Boeing, and many others. This investment was approximately $160 per employee and we’re already seeing positive results. Our goal is for each team member to have the right skills and mindset to help us become the highest performing state agency in the country, thereby providing excellent customer service to you, the Oregon taxpayer. Learning from other states and promoting Oregon: We incurred $21,104 for out-of-state travel to attend national seminars, business meetings, trainings, and association conferences. I’m a great believer in learning from the successes and failures of other states. At a meeting of the National Association of Secretaries of State, I learned how Ohio posted all financial information online, which resulted in our agency implementing such a practice today. Last month, I was invited by the Chinese Consulate in San Francisco to inform high-level Chinese investors about Oregon investment opportunities. I introduced “Pacific Gales” a multi-million-dollar coastal development. My message was that while investing in America is good, investing in Oregon is even better. Large foreign investors are favorably impressed by state leaders who show them respect. When California’s Governor failed to attend, as Oregon’s Secretary of State, I became the ranking official at this important event. Flying to and from San Francisco, with business meetings in between, made for a long but very productive day serving Oregon business interests. Since assuming this office last January, we have upgraded systems, negotiated discounts on long-term contracts, and replaced antiquated computer and software systems. Computer and web security, particularly in the areas of voter privacy, is a top priority! Many of our purchases use the SOS state-issued credit card, which you’ll see listed on the ledgers as “US Bank Corporate Payment Systems.” Our accounting team is diligent in making credit card payments every week so we minimize expenses for you, the taxpayer. In conclusion, the office of the Secretary of State has approximately 220 employees, a $75 million budget, and responsibility for Oregon’s Elections, Audits, Archives, and Corporations divisions. While it can be expensive to administer world-class services, my SOS team is committed to ensuring Oregonians get excellent value for the money we spend. At home, Cathy and I work hard at saving money and looking for good deals. I’m bringing that same focus on savings and value to how Oregon buys the goods and services needed to fulfill critical functions of state government. 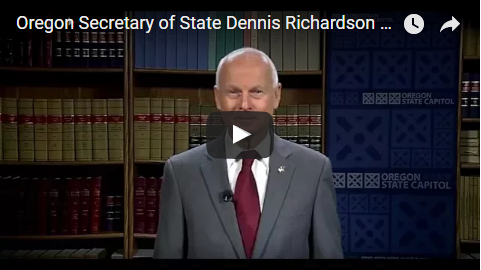 If you have any questions after you check out this new SOS accountability tool online, please know that the Secretary of State’s door is open!